A visit to a major city often inspires wonder at the sight of the impressive skyline and the buildings it comprises. Two of the most beautiful cities in North America, New York and Toronto, boast amazing attractions that allow visitors to see each city from above the clouds: the Empire State Building and the CN Tower. Here is a look at how two of the world's most amazing structures will grant you a view from the top of two distinctly different, albeit equally beautiful, urban settings on the North American continent. Standing 1,453 feet above the organized chaos of New York City, the Empire State Building is not only the world's most famous office building, but more importantly, it's a cultural icon and NYC attraction. Since its public opening in 1931, the building has been a U.S. landmark, smack dab at the epicenter of America's biggest city. Not surprisingly, it's Gotham's most-visited attraction. 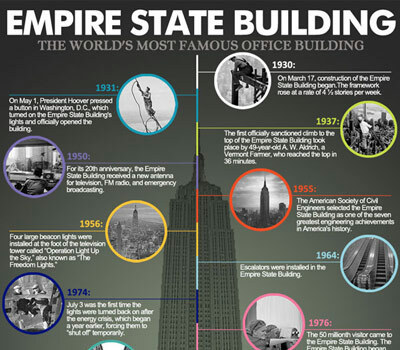 In 1955, the American Society of Civil Engineering selected the Empire State Building as one of the seven greatest engineering achievements in America's history, making it the staple skyscraper for the entire world to include in their travel itinerary. If you find yourself traveling to the big apple, visiting this attraction is an absolute must. The building is open 365 days a year, from 8 a.m. to 2 a.m., with jaw-dropping views of New York City's five boroughs, rivers, parks and neighboring states. And no need to worry about the adventure on the way up; the Empire State Building will sky-rocket you to the top with one of their 73 elevators. General admission gives visitors the chance to see the sights from the 86th floor observatory deck, standing over 1,050 feet above ground. Your bird's eye view will land you some breath-taking pictures and fun memories of the big city from above. Situated almost 500 miles northwest of New York City is the CN Tower, located in the heart of Toronto. Standing at an astonishing 1,750 feet, the CN Tower was built in 1976 and is Canada's most celebrated architectural attraction. 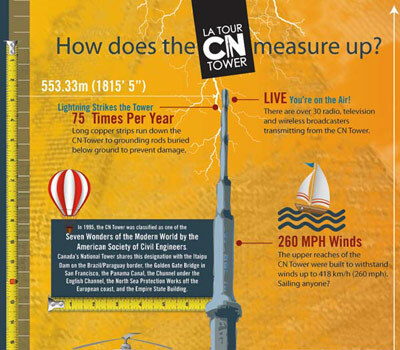 In 1995, the CN Tower received international recognition when the American Society of Civil Engineers classified it as one of the 7 Wonders of the Modern World. The accommodations include views from various vantage points, the highest being the Glass Floor Level at 1,122 feet. Luckily for visitors, the CN Tower features six glass-faced elevators that travel at an average of 15 miles an hour, getting you to the Look Out Level in just under a minute, while also helping you avoid the 1,776 steps to get there. If you decide to take the steps, you'll certainly work up an appetite. The tower is home to the 360 Restaurant, a wonderful dining experience that makes a complete rotation every 72 minutes, giving you a changing view of the city of Toronto and its surrounding areas. On a clear day, visitors can see over 100 miles away – all the way to Niagara Falls. Standing as the tallest structure in the Western Hemisphere, the CN Tower allows visitors a chance to admire Toronto's beauty from atop one of the world's most stunning man-made creations. When your schedule opens up and you find some free time to plan weekend adventures, don't forget about the two aforementioned buildings, sure to give you the most magnificent views of NYC and Toronto. These two architectural masterpieces will help you appreciate the hard-work and talent that went into creating these wonders of today's world.